Do you find yourself looking at your website and printed materials and asking yourself if it positively promotes your brand? If you said yes don’t worry as we have spoken to many business owners who have said the same. Branding is one of the most important parts of building a company. It provides personality, tells your story and establishes your business on the market. It poses a challenge for businesses of all sizes as a muddled and inconsistent brand will have a negative effect on your business. In today’s article, we have put together 5 principles for creating a strong brand that we follow when working with our clients. We start by reviewing your competition and more specifically analyse what they do well and what they could improve on. This research enables us to find gaps in the market where your company can profit. The next step is to create an identity that will resonate with the target audience. A brand has to be consistent across all marketing channels so defining a distinct style with a clear tone of voice is imperative. Campaigns must be devised to increase awareness, drive traffic and strengthen the connection between businesses and consumers. The repetition of company values is vital to engaging an audience. Listening to customers is vital, after all, it’s their perception that defines a brand. Social media, surveys, polls and analytics should all be used to analyse your audience and ensure their demands are being met. 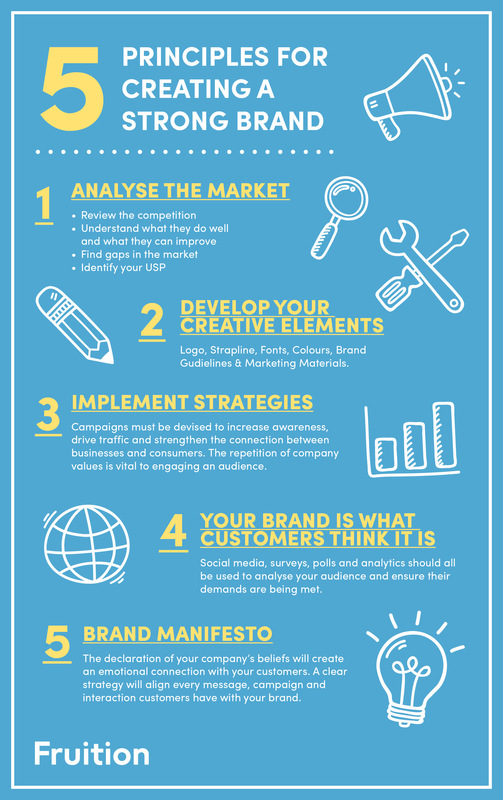 A manifesto should vocalise what your company stands for. The declaration of your company’s beliefs will create an emotional connection with your customers. A clear strategy will align every message, campaign and interaction customers have with your brand.